by Tony Di Nizo The most anticipated and talked about film of the summer (arguably) has rolled in and out of theaters and is on its way to DVD and Blu-ray. Now, with all the chaos of those couple weeks surrounding the release behind us, the question is: Is it any good? My answer is “Eh.” Suicide Squad is certainly a fun movie, but all of its problems stem from studio interference. This is the third entry in the DC Extended Universe that still has yet to deliver a decisive winner among audiences. Each of the three films in the franchise have left critics and fans divided while the incredibly popular Marvel Cinematic Universe has continued to show tremendous staying power, earning respect from both critics and fans alike. So, what is going on with DC? Why do they keep stumbling? It seems like every Hollywood studio is playing catch-up as they try to take part in the cash cow that is the cinematic shared universe. Appropriately, the only other studio to come close to Marvel’s success is their competitor in the comics, DC. As Marvel releases hit after hit, DC Entertainment and Warner Bros. appear to be reactive rather than proactive when it comes to their own films. This hasty and brash behavior is unfortunately where Suicide Squad stumbles and why this film has split audiences. The film ultimately fails at being what it originally promised and advertised. After the critical disaster that was Batman v. Superman: Dawn of Justice, Warner Bros. needed a home run to set the DCEU on the right path and they went all in on Suicide Squad. Hype was built for over a year prior to the film’s release and it only escalated as the marketing campaign continued to impress moviegoers. However, immediately after BvS hit theaters, reports began to surface of reshoots for Suicide Squad that were directly ordered by the studio. It was stated that the new footage was meant to add more “levity and humor” because the chief complaint regarding BvS had to do with its dour, joyless tone. After seeing the film, I believe the rumors were correct because the end result is a sloppy mess. It’s not a catastrophe, but the best way to describe Suicide Squad is a “beautiful disaster.” It looks gorgeous and it’s entertaining, but narratively, it’s in shambles. The plot begins when U.S. Intelligence officer Amanda Waller (Viola Davis) decides to assemble a team of dangerous, incarcerated supervillains for a top-secret mission. Now back in the field, Deadshot (Will Smith), Harley Quinn (Margot Robbie), Captain Boomerang (Jai Courtney), Killer Croc (Adewale Akinnuoye-Agbaje) and other despicable inmates must learn to work together to stop The Enchantress (Cara Delevigne) from using a deadly doomsday device. The film has serious pacing and plot issues due to the studio’s concern with tone. Personally, I find DC’s fixation with a lighter tone absolutely ridiculous. This is a film about villains — it should be dark. Sure, a few moments of levity are not unwelcome, but forcing a lighter tone decreases the weight of the characters’ actions and the story. Audiences were upset about the tone of Batman v. Superman because it’s a movie featuring Superman. A Superman movie should not be dark and depressing, it should inspire hope and optimism much like Superman himself. The tones in BvS and Suicide Squad should have been flipped, with BvS being lighter and Suicide Squad being darker and more serious. Now we are stuck with dark heroes and light villains. This reversal does not create a new and unique spin on these characters and stories, it just tarnishes what made people fall in love with these characters in the first place. Despite pushing a tone that doesn’t fit the subject matter, the studio succeeded in turning dark drama into upbeat fun. Watching these characters interact is really enjoyable and holds the film up from start to finish. However, the relentless dependence on getting to that more lighthearted tone is distracting. I really wish they stuck to their guns and didn’t blink post-Batman v. Superman. Watch the first official Comic-Con trailer for Suicide Squad and then watch the final trailer — they look and feel like two completely different movies. And from what I understand, the original intentions were very different from what ended up in theaters. At this point, some background info is necessary. During the weekend of the film’s release, more reports surfaced about the sequences that were cut from the film and a common thread appeared. The scenes that were left out featured darker plot points and character beats, particularly scenes featuring the more disturbing elements of the relationship between The Joker and Harley Quinn (more on that later). What we’re left with is a film that was so obviously reshuffled in post-production that I felt like I was watching the wrong edit. And frankly, we all could have been, because after the overwhelmingly positive response to the “Bohemian Rhapsody” trailer, Warner Bros. hired the trailer house behind it to recut the movie while the studio simultaneously worked on their own version. There were two cuts of the same film being worked on by two different groups at the same time. The studio panicked and to be perfectly honest, I’m not sure which version is the one we saw. The day after the film’s release, The Hollywood Reporter published an incredibly detailed expose about the troubled production of this film. David Ayer was only given six weeks to write the script and the film raced to meet its release date. I’m not going to go into a full summary, but I do recommend that you check it out; it will give you a whole new perspective on the film as a whole. That’s enough about the behind the scenes drama — let’s discuss the finished product. I don’t hate this movie. On the positive side, there’s a lot here that doesn’t need to be fixed. For starters, the casting and acting is stellar across the board, with Margot Robbie, Will Smith and Viola Davis excelling. Each of these actors do a ton of heavy lifting and elevate the material they’re given. Everyone else in the cast does a nice job as well. The only real character issue is that some of them have absolutely nothing to do. Killer Croc and Katana are sidelined, which is a shame. Both of these characters have unique personalities and abilities and we don’t get to see much of them. Without a purpose in the story, these characters just clutter up the cast. The film would have benefitted from having fewer characters on the squad and making sure that the entire ensemble got enough screen time to show off what makes them interesting and special as individuals. The first 40 minutes of Suicide Squad are stylistically strong. It’s visually striking, fast-paced, and unlike anything we have ever seen before in a comic book film. Basically, the first act is a series of music videos introducing each character, and although it’s an interesting decision, I feel like it only made the film feel disorganized. The execution of it is enjoyable, but the content isn’t. Each “music video” spotlights its character’s origin, but each story feels rushed and underdeveloped, especially considering that each of these characters have a backstory that could support an entire film on their own. At least six movies worth of material is burned through in roughly half an hour. The opening would have been more effective if it just focused on these characters in prison and how they got there. Instead, we get a series of rushed origin stories that collectively operate more like the beginning of a sequel than the start of the first film in a franchise. The origins ought to have been saved for later films, where they could be fleshed out to their full potential. Typically, Suicide Squad stories in the comics center around Deadshot, because out of all the squad members, he’s the most redeemable. Deadshot is essentially just a talented assassin and, unlike the rest of the squad, he isn’t mentally unstable. This level-headedness makes him the perfect guide for the audience. He’s still a criminal, but one that has sound and selfless motivations. This is why I was expecting the opening to explore his origin exclusively. A stronger film that does exactly this is Guardians of the Galaxy. That film opens with the origin of Peter Quill and the rest of the team is introduced along the way. This tells your audience exactly who to care about and why. Suicide Squad suffers from not having a clear protagonist and this flaw is made apparent in the opening, where the film itself seems confused about who the main character is. The opening also introduces several interesting ideas, but it doesn’t give each of those ideas the proper time they need. Take, for example, the origin of Harley Quinn. Throughout comic book lore, characters frequently have their origins retold and reinvented as time goes on, and Harley is no exception. She’s had two origin stories in the comics and this film does a really solid job of combining the two. Ayer hits the major beats of her classic origin while incorporating elements of her new one. However, he leaves out crucial details that would have helped solidify the audience’s understanding of the character. These details include how Harley slept with her professors in medical school in order to write a tell-all book about the Joker, and how she used manipulation to get her position at Arkham Asylum before being manipulated herself. The film presents it as if it was an accident that Dr. Harleen Quinzel was assigned to the Joker. They paint her as a victim of circumstance, when in the comics, she deliberately pursues the Joker. Motivations like these are lost because the filmmakers decided not to include them. By not showing the full origin story you rob the audience of that story’s full impact and significance. After the film speeds through all of the origins, the main story kicks off and the film takes an even bigger dip in quality as a painfully clichéd story is revealed. This film repurposes the now tired and overused action movie trope of the villain creating a doomsday device in the center of a city while our heroes battle through an army of mindless cannon fodder to reach said device, which is shooting a blue beam into the sky for no reason. This trope needs to end. It’s boring, and I’m sick of seeing it. The fact that this is Enchantress’s plot is incredibly disappointing. Her character is very cool, she has a great look and has really interesting abilities in the comics. But the film reduces her to an evil witch with an unexplained power set. Because the character is loosely defined, the mission almost immediately falls flat. Speaking of bad guys, another major problem with Suicide Squad is that the main characters are bad guys in name only. We are only told that they are criminals and we don’t actually see them doing anything bad. I immediately suspected that those scenes were cut to lighten the tone and apparently this is indeed the case. Around the time of release, reports surfaced of scenes in which characters like Captain Boomerang say racist and misogynistic things to some of the female characters in the film. Moments like these are needed for us to understand that these are bad people, but the worst thing that Boomerang does in the movie is vacuum up diamonds with a dust buster. Another instance of telling instead of showing involves the squad becoming a family. Rather than seeing them grow as characters, we’re told through dialogue that they become a cohesive group. During the climax, the character El Diablo says that the squad is “his family.” but the film never convinces us that it’s true because up until that scene, the squad doesn’t trust each other. Jokes are clearly chosen over character development. 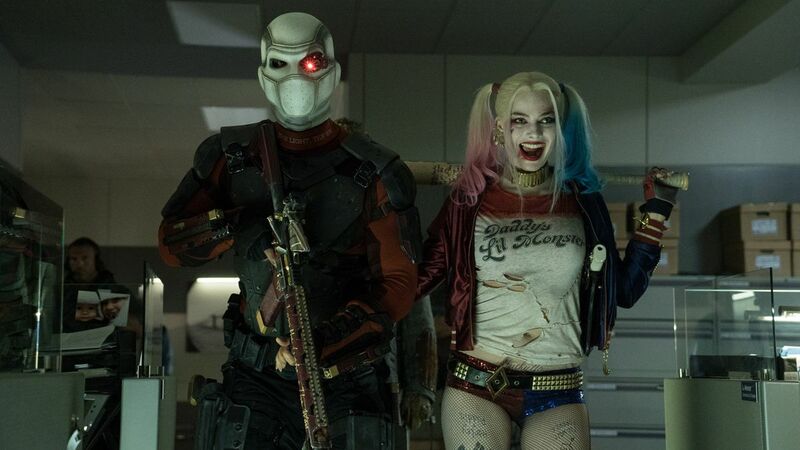 Suicide Squad points to larger problems at Warner Bros. as a whole. The studio has stated that they’re going for an auteurist approach to their DC films instead of the formulaic approach that Disney has taken for their Marvel films. This means that they don’t want each of their movies to look and feel the same way. The homogenous look and tone of the Marvel films have been a consistent complaint leveled at the MCU and it’s completely valid. By repeating these things you run the risk of audiences getting fatigued of the same old schtick. The rationale to DC’s approach is ensuring that each film feels fresh and is distinctively visualized. I commend WB for putting so much faith and trust in their directors because doing so is incredibly risky. However, it’s frustrating as a fan to see these films botched at the last minute by a studio that is scared of the finished product. Why go the artistic route if you are just going to get cold feet and damage the film right before releasing it? These executives can’t afford to blink; if they don’t stick to their guns, they’ll continue to have divisive and disastrous results. We’ve all had the experience where, after seeing a film, you recall moments in the trailer that weren’t in the movie. It’s annoying, it’s disappointing, and I’ve never seen it take place to such a degree as it has does with Suicide Squad and its scenes featuring the Joker. I enjoyed his performance, but there really isn’t much there to make a fair judgment, as the sample size is way too small. Jared Leto’s Joker has had a mixed reception since the first image of him sporting several on-the-nose tattoos was released. While the drastic change in appearance was alarming to some, I found it to be a really interesting and fresh take on the character. After Heath Ledger’s iconic turn as the Joker in Christopher Nolan’s The Dark Knight, I felt that the best way for the filmmakers to distance themselves from that performance would be to change his appearance. Changing the character essence would be sacrilegious, but altering his appearance would minimize the comparisons between the two actors. I found the creative choices behind this Joker fascinating because typically, live-action Joker interpretations adapt one version of the character from a specific era in the comics. There are four eras when it comes to the history of comics: The Golden Age, The Silver Age, The Bronze Age, and The Modern Age. Each of these “ages” featured different interpretation of the Joker. To date, each live-action adaptation has used one of these eras as its source material. However, this version is the first one to be a combination of two eras instead of a representation of just one. Leto’s Joker is a mix of the Silver and Modern Age versions of the character. In other words, he’s a modern Cesar Romero who decided to shop at Hot Topic. This Joker is much more goofy than Ledger’s version and much more flashy in his choice of wardrobe and vehicles. The little bit of screen time we get with the Joker is enjoyable, but that brevity is just the problem. The trailers led us to believe that the Joker was going to be a major part of the movie, but most of his scenes in the trailer were ultimately cut from the final film. I understand that sometimes shots from the trailer don’t make it into the final cut, but in this case, it’s an unusually large number of sequences that are missing. His storyline is so blatantly undercut and reshuffled that it makes his subplot seem completely unnecessary to the overarching story. The Joker just distracts from the squad and their journey rather than adding any interesting layers to the film or the universe. While the Joker stumbled, Harley Quinn excelled in this film. 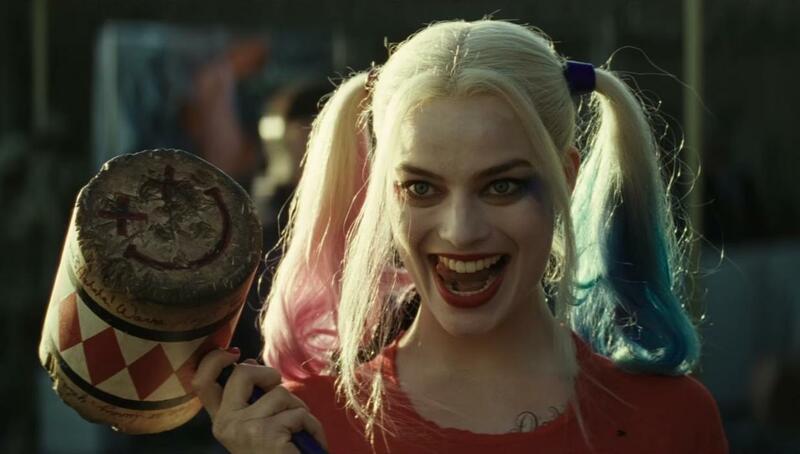 Margot Robbie is so much fun to watch and perfectly embodies Harley Quinn’s personality and spirit. She has a great look, showcasing elements from past incarnations and seamlessly adding new ones to create a compelling and incredibly modern take on the character. While she looks great, her voice needs some work — in some scenes, she sounds just like the Harley of the animated series, while in other scenes, it just sounds like Margot Robbie with an American accent. Her shift in voice was a little jarring, but it didn’t distract too much from her overall performance. Although the Joker and Harley Quinn are accurately brought to the screen, the filmmakers stumble when it comes to their relationship. It is romanticized in this film, with the Joker’s only motivation being to get Harley back. In the comics and animated series, the Joker has never loved Harley Quinn and has never cared about her well being. The film boils down an incredibly nuanced and complicated relationship to one of mutual affection. Harley was first introduced as a way to explore Stockholm syndrome and domestic abuse. However, the abuse is nowhere to be found in this film. I never thought I’d say that I’d be upset about a film not showing domestic violence, but it’s a key factor in their relationship. Their bond is twisted and one sided — she loves him, while he is merely fascinated by her obsession with him. The Joker frequently beats her in the comics, and even the animated series showcased the abuse (which is amazing when you think about how such a sophisticated and unfortunately realistic relationship was displayed in a cartoon aimed at children). This film erases that sophistication and everything that makes their relationship interesting. She’s not the Joker’s girlfriend because he doesn’t see her as his girlfriend. She’s caught up in a fantasy while he is willing to leave her at a moment’s notice. The film loses Harley’s sad and tragic obsession with a man who would discard her. Marketing materials and set photos showed signs of the abuse, but once again, they were cut from the film. See a pattern emerging? Apparently test audiences were turned off by the abuse, so it was cut out of the film. This is absolutely ridiculous. Of course they found it disturbing — you’re supposed to feel that way. Can you imagine if a test audience saw a Batman film and said “We don’t like how the Waynes get murdered because we think it’s a total downer?” What would the studio do? Change the fundamental relationship of the characters and story? Well in this case, yes, they have. When Amanda Waller (Viola Davis) describes their relationship early on as “the King and Queen of Gotham,” I immediately knew that the original portrayal of their relationship was lost. Saying that they are the king and queen implies that they are equals and partners. But that’s wrong, as the Joker is very much the king, while Harley is literally the court jester. That’s the point of their relationship. Delusional, she sees herself as his queen and he sees her as his humble servant. See how complicated it is? It’s not as simple as the film suggests which is really disappointing. While the relationship between the Joker and Harley is disappointing, this movie really delivers visually. As a fanboy, I freak out whenever I see images or scenes play out that come directly from the comics. It’s nice to see films actually embrace the source material instead of doing what the early comic book films did, which was make it “cooler” and less goofy. Like the infamous line from the first X-Men film “What were you expecting? Yellow Spandex?” YES! I WAS EXPECTING THAT! And now comic book films are really embracing the sillier and more cartoony elements of the stories and it’s only helping them out. The filmmakers behind Suicide Squad even go so far as to directly recreate iconic panels. For example, Deadshot’s title card in the beginning of the film is a direct recreation of the cover for Secret Six #15. Also, when Amanda Waller is talking about Harley Quinn’s past, they show a direct recreation of the iconic Joker and Harley painting by Alex Ross. The film also perfectly recreates Slipknot’s death from the comics. I applaud this film for not only embracing the source material, but also recreating iconic imagery in a faithful way. In conclusion, I must reiterate that I don’t dislike Suicide Squad. Is it perfect? No. But is it entertaining? Yes. If you’re looking for a fun time at the movies, you’re going to enjoy Suicide Squad. The film features great performances from a well-cast group of actors, a fitting soundtrack, stunning visuals, and some great humor. It ultimately suffers from plot and story problems that could have been fixed if David Ayer was given the opportunity to make the movie he wanted to make. The best way I can describe my feelings about the film is sheer frustration. I saw such great potential for an amazing film, but most of it was unfortunately cut out. Despite my many issues, I would still recommend the movie because the things I don’t like about Suicide Squad are a result of cynical fanboy nitpicking. If you’re just a regular movie goer who enjoys superhero films and are not infatuated with comic book lore, just sit back and enjoy the ride — I think you’ll have a good time.